At Discover Market Wealth we employ a unique approach, developed over several years by independent representatives in the Financial Services Industry. Early on, those representatives realized that for their clients to truly succeed in establishing an adequate retirement, the representatives would need to provide products that would help their clients achieve greater returns or help them retire on less income. There was no product that will provide the returns their clients needed to earn a modest retirement income. 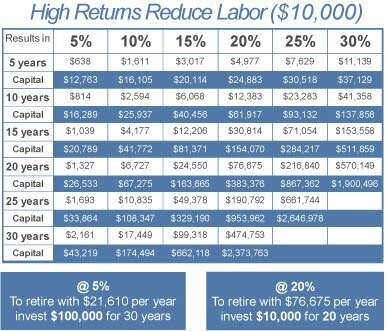 In fact, to retire with only $21,610 per year, a client needed to deposit $100,000 for 30 years at 5%. Traditional investments require too big a pile of money to retire at traditional rates of return or provide too little income when needed. The answer? The financial firm would have to encourage their clients to take investing into their own hands. This was unheard of in the industry. After considerable effort and research, the firm partnered with a Canadian company willing to educated their clients to learn to trade their own investments. After much personal trading success, the principal of the firm began to tutor students informally. He shortly discovered that there were even better ways to teach, follow up, and encourage solid learning. As a result, after several years that principal along with a partner started Discover Market Wealth in 2009. What makes us unique is our desire to see people succeed financially. The last thing most financial firms want is for you to learn to invest your money yourself. We have built a system that takes responsibility for the student's learning and does not simply provide information or magic software. Our students are from all walks of life and backgrounds, and they succeed because in a short period of time they became virtual trading experts due in part to our one-on-one mentoring. Traditional investing requires a great deal of capital over a long period of time to accumulate a big enough pile of money to eek out even a modest retirement income. However, when a client learns to invest their own money with an expectation of 1% per week increase on their investments, they can build wealth in a much shorter period of time and with less effort and risk than traditional methods.